← I am my mother’s daughter. What I’ve learned from 24. I wasn’t going to write a post where you all saw how incredibly addicted to a couple TV shows I am, really I wasn’t. And then I saw this really exciting news and I got so excited that I had to share. I know that the rest of you watched 24 back in the early 2000s, but I was busy designing clothes for my American Girl dolls and convincing my parents that we should get a pony, so I have a little catch-up. James and I started it a couple months ago, and I am a little addicted. I mean, how can you stop watching a show where one man will save us all from looming terrorist threat SO MANY TIMES IN ONE DAY???? I mean, when does he go to the bathroom or eat??? 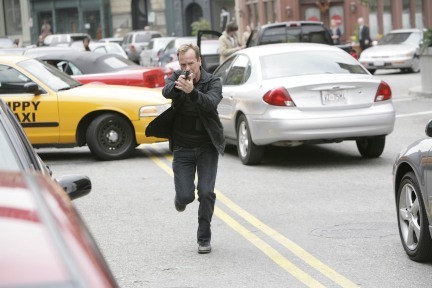 Oh wait, he’s Jack Bauer — he has already dominated all bodily functions and feeds off his own adrenaline to keep going. And once you start watching an episode… you have to watch another, and another, until you too have spent a day in real time stressing over terrorists. This is a big deal for me, since my favorite tv shows ever are more along the lines of Gilmore Girls, Dr. Quinn Medicine Woman, and Boy Meets World. But something about the whole world hanging in the brink of disaster, Jack Bauer’s flagrant disregard of the law, and unapologetic evil of the bad guys that was possible in the early 2000s (now we get all concerned with “understanding their stories”), is just really hitting the spot while I grade papers and tests. I have learned a lot of valuable lessons from 24, and I have a few to share with you today, prompted by my excitement that it is coming back, the fact that we watched wayyyy too many episodes last night, and the fact that I am bored with the writing of my own final paper… which doesn’t bode well for the professor who will have to read it. Trust no one. There are all spies. Or they know spies and don’t know they are spies and will accidentally turn you over to terrorists, who are lurking everywhere, all the time. If Jack Bauer says to trust him in a super intense and ragged voice, and he will do so at least five times per episode, you should, even if it involves breaking a lot of laws and risking the lives of countless individuals. Otherwise, the entire safety of America/the world will be in jeopardy. David Palmer for president, for life. I now feel the need to sneer at all political hopefuls and inform them that they are no David Palmer. It makes me want to find and elect him and buy Allstate insurance. Behind every David Palmer, there is a Sherry Palmer…. don’t ask how she gets things done because you don’t want to know. Like maybe she yelled at your political enemy so ferociously that he had a heart attack. If you suspect you might be like Kim Bauer, do not ever follow your instincts. Do not go after escaped terrorists alone, do not decide that dark deserted alleys look inviting, and for the love of all that is good, just obey when someone smarter than you (which would mean everyone) tells you to do something. If you think you won’t give up important facts no matter how much someone tortures you — you’re wrong. You have not met Jack Bauer. So just do it early so I can take a pillow off my face because those scenes are a little much for me. Los Angeles is a horrible place. After a couple seasons of 24, I am confirmed in my decision to never go to L.A. for any reason. It is unattractive and dangerous. You never know when you could be innocently driving along the free way and SUDDENLY GET CAUGHT IN A HIGH SPEED CHASE WITH TERRORISTS AND DIE, or be just doing your daily stuff and find out you are at risk for a high contagious air-borne super virus, or find out that there is a bomb about to go off. Basically, L.A. is just bad news and I have decided to increase my chances of happy healthy living (read: not being killed by terrorists) by never going to this city. (I realize that D.C. isn’t exactly far off the list of top targets… but it has yet to have many seasons of a suspenseful show dedicated to all the ways I could innocently die here. I am pretty pumped to watch the new season of 24 for many reasons, but one of the biggest: smartphones. This is going to seriously revolutionize stuff. I am also secretly hoping that Kim dies in one of the seasons I haven’t watched yet because I just can’t take her anymore. 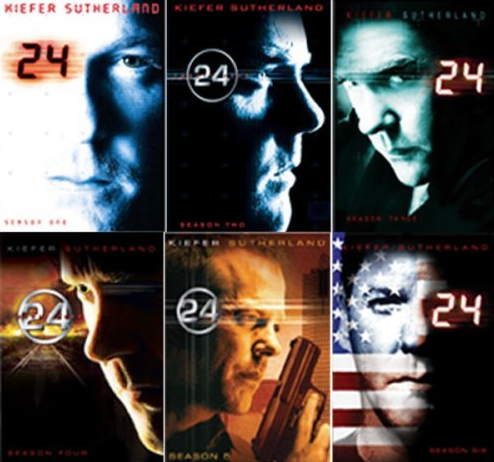 Are you a 24 fan … or where you one when it actually came out like a million years ago? This entry was posted in Uncategorized and tagged confessions, tv. Bookmark the permalink. 13 Responses to What I’ve learned from 24. A new season of 24 is the happiest news I could get today! (I could tell you were only partway through the seasons by a few things you said here – you have to finish them!) Also, movies and other TV shows are entirely unexciting and unbelievable after watching 24. I had a really bad cold/flu one time and tried to watch a few seasons of Alias… I couldn’t handle elapsing time in cinematography. I became a fan right before we got married, and, believe it or not, I can’t get Aaron into it. (He probably thinks Jack Bauer is a bit of a pansy compared to him, honestly.) I hold onto hopes that he will become a fan soon and then I can rewatch all the seasons with him. Come out here and we can watch them all together!!! See, I know logically that DP can’t stay president forever, and that Sherry will probably get herself killed soon enough, but I just love him so much that I can’t bear to let him go. And even though Sherry is out of control… she gets stuff done. We are a little over halfway through season 3 (the killer virus season) and it is CRAZY. And I have heard that they will get to DC eventually… sigh. At least it is pretty and dangerous, whereas LA just looks yellowish and dirty. Also: Don’t ever watch it when James is legitimately out of town and not coming home that night. I learned this the hard way. One time I tried to watch a season late at night while Aaron was in Japan. I called my sister after midnight almost in tears because I was afraid to go down to the garage and switch a load of laundry. I absolutely LOVED 24 when it was on and I lived and breathed it. I, too, also wondered when Jack Bauer went to the bathroom or ate… or did anything besides chase bad guys and get caught by bad guys… but then I remember… it’s Jack Bauer… he does what he wants! He does indeed do that! He’s pretty much like a real life superhero (and by real life, I mean real TV life of course), and that is why we love him. Although every now and then I will get a little annoyed at his savior complex. But then he saves LA… again…. and i forgive him. Isn’t 24 just Dr. Quinn Medicine Woman with fewer Indians? Pretty much, and more modern medicine… and financial currency other than pies. LOL! This sounds like lessons I learned from my own life (especially the L.A. bit). I may have to watch this show.